A trustee has a duty to establish return objectives consistent with the trust purposes, terms, distribution requirements and other considerations. But as all trustees know the outcome is rarely consistent with the plan. Target returns, upon which sustainable distributions rely, are almost never accomplished. 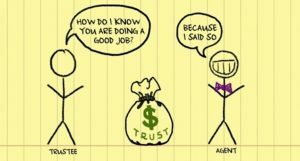 Each year the return from the trust corpus is either higher or lower than the trustee’s objective. It’s not the end of the world: Failing to accomplish a targeted rate of return does not necessarily mean that the original return objective was wrong. A reasonably designed portfolio will have good years and bad years. Having low performance in one period does not necessarily mean the investment strategy employed by the trustee is wrong. Take the time to confirm that despite under performance of the trust in 2018 the long term return expectations remain reasonable. “Bond Bunker”: A prudent trustee will have a reserve of cash or short term bonds from which current distributions can be made despite the under performance of the overall portfolio. Years like 2018 give the trustee the opportunity to revisit the amount of “safe stuff” held by the portfolio to sustain distributions, perhaps for an extended period of time. Benchmark Study: A trustee who has delegated investment responsibility to an Investment Advisor has an ongoing duty to monitor the activities of that delegatee to determine if the advisor’s activities are consistent with the trustee’s delegation. (Are they doing what they said they would do?) A best practice is to have a benchmarking study done by an independent party because the advisor’s analysis, predictably, will conclude they are doing a fine job despite the recent under performance to the targeted return. Adjust Distribution Scheme: If the low investment returns puts in jeopardy the trustee’s ability to accomplish the trust purposes a record of this determination should be made. Further, a reduction in the trust distribution rate should also be considered. For a deeper dive on the trustee’s duties and the procedures to fulfill them, following is a link to a 1 hour recorded webinar in which we review fiduciary governance best practices.